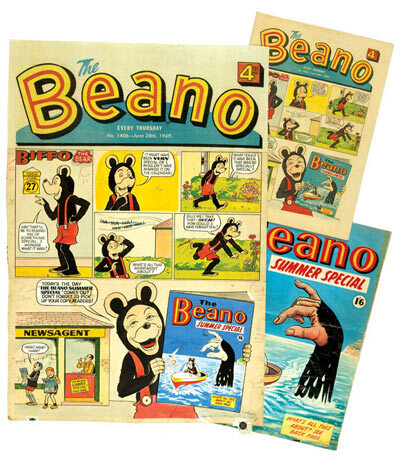 Artwork doesn't often make our lead in the Market Report but this 1969 Beano front cover by Dudley Watkins had Biffo promoting the publication of The Beano Summer Special, out that same week. 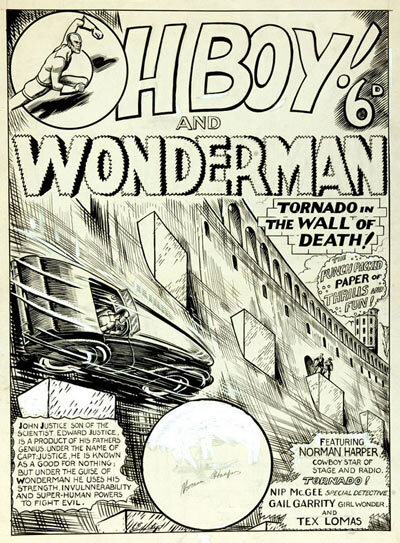 Watkins had also drawn the front cover of the Special and he had to redraw it in small scale for the Beano artwork last panel as well. 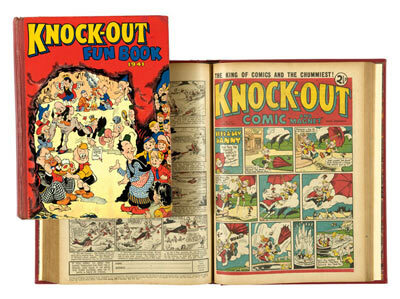 These Summer Specials are highly collectable in their own right and this strong combo included the original comic and was bid to £3410, a new record. 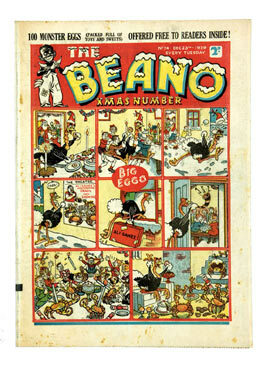 Apart from the first 10 issues of The Beano, the war years Christmas numbers have the most value. 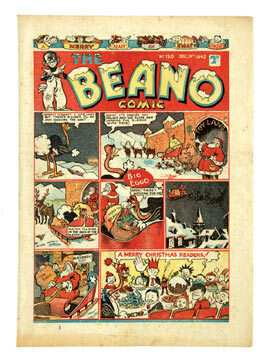 1939 Xmas went to £301, and 1942 received £290 - early presents for their new owners. 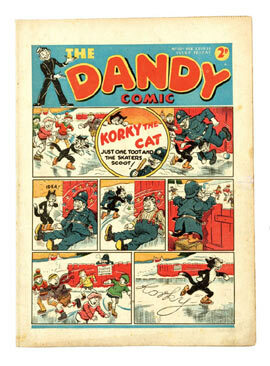 Two early Dandy issues with neat small repairs found strong favour with No 10 at £220 and No 13 at £206. Other issues from the same era were bid from £80-160 each. 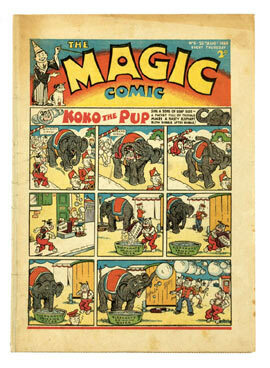 Our run of Magic comics continues to find favour with collectors. Although not so well known and having only survived for 80 issues, they are actually rarer than their longer lasting DC Thomson siblings. A bright covered No 5 with small repairs made £154 with a vg+ No 6 at £184. Dull, worn later issues were sold at £40 each. 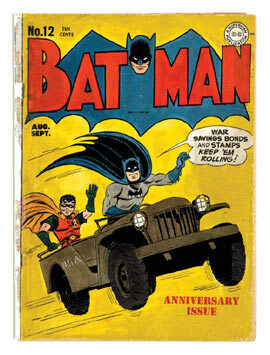 Who knows what inspiration Bill Finger and Bob Kane might have found in early 1939 when conceiving their crime-busting caped crusader, The Bat-man? But here was his 1913 precedent, The Winged Man: 'The story of a strange genius possessed of Wonderful Powers of invention who sets forth to deal out Justice to the Evildoers of the Modern World'. 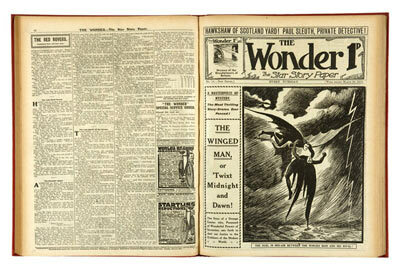 Featured on the cover of The Wonder, issues 1-26 in a bound volume made £242. Ka-Pow. Early girls' story papers are well collected and also rarer than their male counterparts as print runs were considerably lower for a target market much more concerned with cake-making than comics. 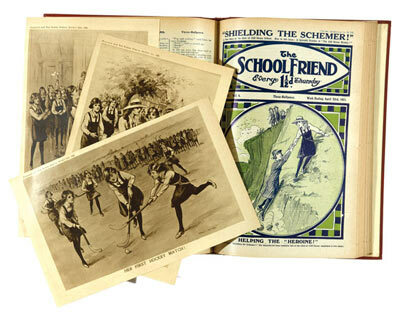 The 1921 bound year of School Friend starred Bessie Bunter with free gift art-plate of her less rotund classmates playing hockey. Bully off at £231. 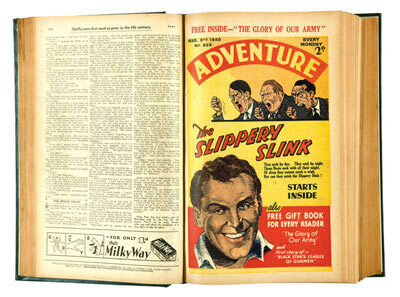 Adventure's complete year for 1940 was full of propaganda war stories, often featuring Hitler and his cohorts on the front cover. Illustrated here, they railed at their nemesis, The Slippery Slink for £330. We offered three key war years Knock-Out bound volumes and several of our customers had waited long years for them to turn up. Sexton Blake, Deed-A-Day Danny and Stonehenge Kit (The Ancient Brit) progressed from 1939 (issues 18-44) at £242, 1940 (45-70) at £329 and 1941 (97-122) with Fun Book of the same year at £347. Prize fighters. 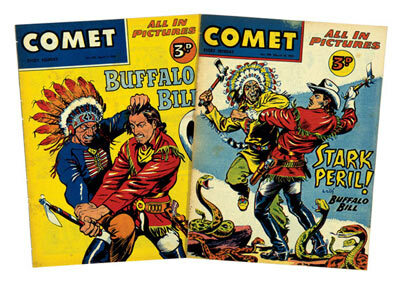 Comet was a bright weekly starring Buffalo Bill, Claude Duval and Strongbow (The Indian Chief, not the cider) but £302 was quite a heady brew for 37 consecutive issues at £8 a pint. 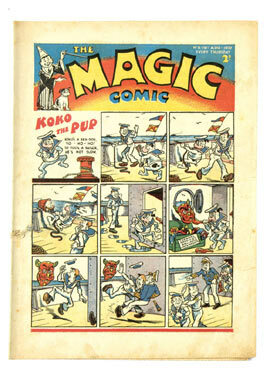 This atmospheric artwork by H Stanley White was produced for Mick Anglo's Paget Comics imprint in 1951. A combination of 2 titles, Oh Boy! And Wonderman lasted for only the one issue. £605 strongly underlined its rarity. 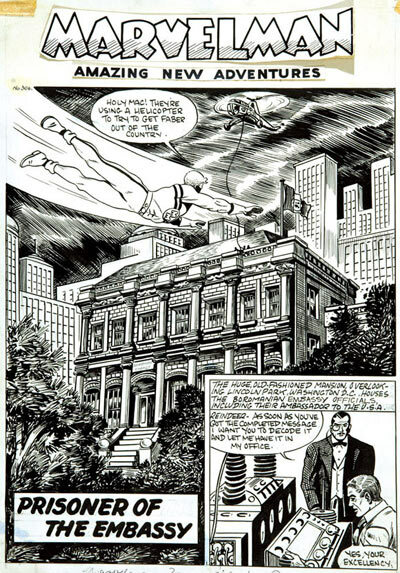 This artwork, drawn by Mick Anglo, himself, was for his highly successful Marvelman title, and continuing the upward trend of UK artwork, made £550. This piece was donated to the Oxfam shop in Stowmarket, Suffolk and Compal is pleased to defer the 20% vendor's premium. 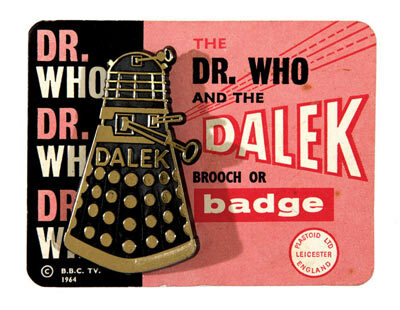 No wide lapel would be complete without Doctor Who's Dalek Pin Badge, originally for sale in Woolworth's for one and thruppence in 1964 - now available on original card at £61 in 2010 (use Dalek voice..) In-fla-tion - In-fla-tion. 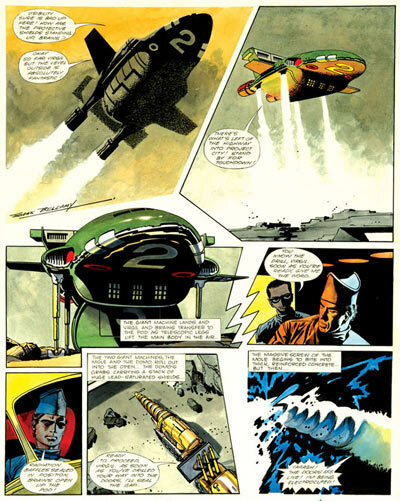 Frank Bellamy is one of the most highly regarded artists in the comics fraternity and his artwork for TV Century 21, especially Thunderbirds, does not often come onto the open market. This signed board from 1969 with triple perspective panels of Thunderbirds 2 coming in to land ticked all the collecting boxes, Bellamy's magnificent piece finally selling for £3288, a hotly contested record. 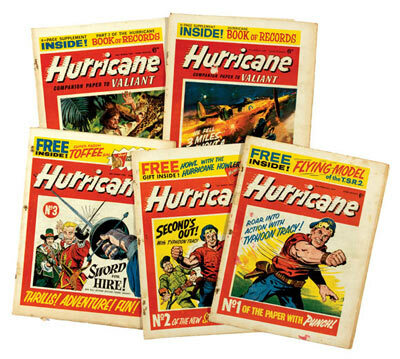 Hurricane starred Typhoon Tracy, Kid Solo, Sword For Hire and Rod The Odd Mod but there was nothing odd about the prices garnered for this unbroken run of 72 issues offered over four lots. 1-5, illustrated above, were in low grades finding £77 but the other higher Hurricanes stormed to £447 averaging £7 each. We also offered some pretty worn Commandos but bidding was feverish: 11 issues between 19 and 69 (two lacking back covers) rocketed to £556 with a further lot of 11 in vg grades at £448. More than £1000 together. Bravo 3 zeros. 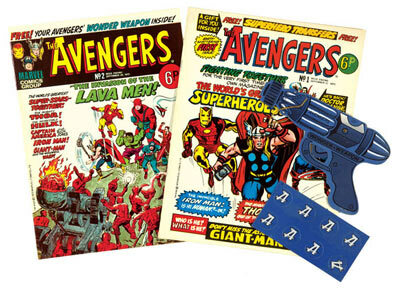 1970s comics need to be in high grade just to make buyers interested but here were wonderful examples of the first two issues of Avengers complete with requisite free gifts. We were even asked by the eventual winning bidder if the Avengers Wonder Gun ammo was still intact within its pop-out card. It was and £221 was duly proffered. With neat amateur restoration, Batman #12 from 1942 made £88 and Fantastic Four #1 with chipped back cover didn't leave Ben Grimm at £640. Remember eleven years of our previous sales can be accessed via our ComicSearch facility with all the original text details. Over 13000 lots are available and this service is free. In Stanley Kubrick's 1964 film of Dr Strangelove, Peter Sellers plays the eponymous character who is handicapped by a wayward right arm which is given to performing - without warning - a Nazi salute. 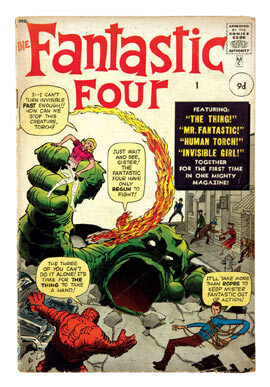 A few weeks ago I heard of a small auction in Cornwall where a few comics had been lotted for sale in the middle of a book section without any fanfare or much advance publicity. After discreet inquiries I was able to determine that nearly 200 Dandy comics were being offered in one lot from No 18 to No 220, an almost complete war years run with a guide price of £1000. In our business grade is everything but to ask too many questions about condition on the phone might alert the proprietors to their real value so I decided to take a quick break in Penzance to check them out for myself. Entering the near empty saleroom on the day before the sale I casually leafed through the Dandys whilst also checking a half a dozen other lots in which I had no interest whatsoever. They were in pretty good nick so I decided to attend the following day and snap up my bargain. I wandered in around teatime about 15 minutes before my lot was due to come up to find a saleroom packed to the rafters, 3 dealers known to me at the back and two of the harried staff connected to telephone bidders. Then The Dandys came along and I was surreally looking at Dr Strangelove's outstretched arm as the bidding passed £3000, £4000 and £5000, finally stopping at £6700 when the arm reluctantly dropped back to my side. Every face was turned towards mine as a small frisson of applause echoed round the room. If you've ever won anything at auction you will know that this is the death-knell code for, 'everyone look at the prat at the back who paid too much'. I'd like to tell you that this is the first time I've ever gone over the limit in the auction room but as many of my customers will confirm, you just have to stop the other bugger getting it.